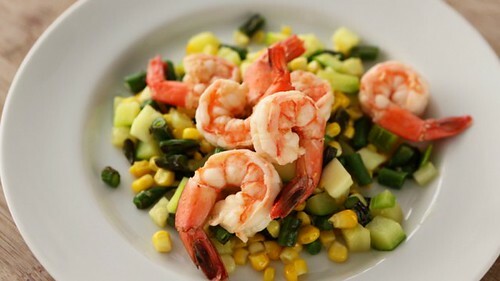 Shrimp (read here more news about shrimp) is versatile and can be prepared in various ways with a variety of accompaniments including staples and vegetables. The poached shrimp with succotash is one such meal which requires simply 1 teaspoon Old Bay seasoning, 1 lemon, halved,1 pound large shrimp, peeled, 2 tablespoons champagne or white-wine vinegar,1 teaspoon Dijon mustard,1/4 cup extra-virgin olive oil, divided, 1/2 pound green beans, trimmed and cut,2 cups corn kernels, 2 medium zucchini, diced medium, salt and pepper. To prepare the dish first poach shrimp by combining 6 cups of water, Old Bay, and lemon in a medium pot. Bring to a boil then add shrimp and simmer until the shrimp is opaque throughout for about 2 to 3 minutes. Drain, discard lemon, and place in a bowl. Next toss the shrimp with vinegar, mustard, and 2 tablespoons oil. Then in a large skillet, heat the remaining 2 tablespoons oil over medium-high flame, add green beans and cook until bright green. Add corn and zucchini and saute until crisp-tender. Transfer to a platter, top with the shrimp mixture, season with salt and pepper, and serve.